2008 November : Audio Design Labs Inc.
Huntington, West Virginia may not be the hub of the music production world, but veteran musician Keith “Plex” Barnhart plans to change that. 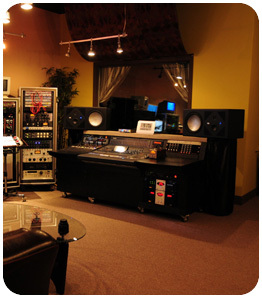 With the launch of The MusicPlex Studios, earlier this year, Barnhart has taken his 25 years experience — as a stage and session player with artists including Chaka Khan, Bette Middler, Janet Jackson, Brian Wilson, Paul Simon, and Sting, to that of a composer, programmer, and songwriter for TV and radio media—to create a commercial studio addressing the needs of the professional market. Barnhart outfit the 2,500 square-foot studio with a broad mix of the latest gear capable of recording and mixing over 96 tracks in high-resolution audio. For the critical monitoring functions, he decided on a Big Blue system, based on recommendations from friends and colleagues.